McKenzie adds that Tyler Toffoli of the Los Angeles Kings could be a fit. Joe Rexrode of The Tennessean: Don’t think the Nashville Predators are done making moves. thinks GM David Poile could package a core player with picks and/or prospects and go after a bigger scorer. Could the Predators go after Artemi Panarin, Mark Stone or Wayne Simmonds? 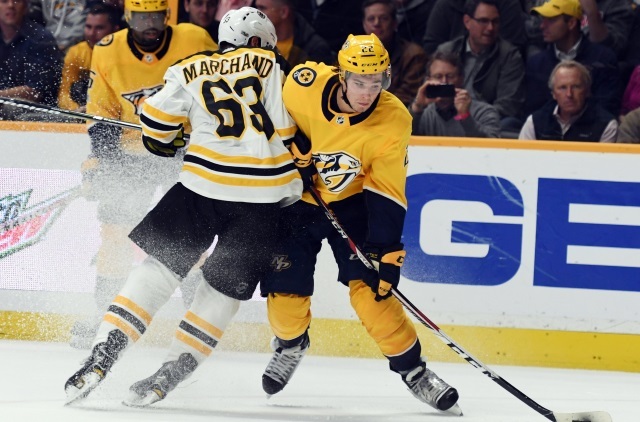 Would the Predators be okay with moving out Kevin Fiala, Craig Smith or Eeli Tolvanen? Chris Nichols of Nichols on Hockey: Bob McKenzie on NBCSN was talking about the Nashville Predators trading for Brian Boyle and Cody McLeod. McKenzie notes that now teams are probably thinking the rental market is set and now we are going to get first-round draft picks for all their guys. The window for the Predators is open and they could add some more. “I could see David Poile trying to do some big game hunting. And whether that’s Artemi Panarin in Columbus, or if Matt Duchene or Mark Stone become available in Ottawa, at least give it a go to see what the cost would be.